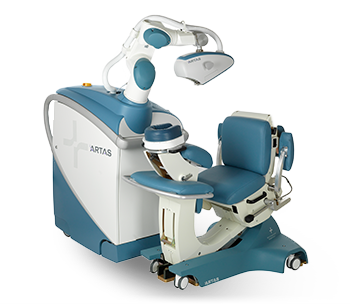 How does hair transplantation with the ARTAS® Robot Assisted FUE System work? Under the control Dr. Anderson, the ARTAS® System utilizes its robotic arm and sophisticated digital imaging to harvest follicular units from a patient’s donor area (the back and sides of the head where the “permanent” hair is). Every 20 milliseconds it re-calculates hair position, angle, and other parameters to track each follicular unit to achieve optimal harvest results. The ARTAS® technology targets follicular units in a random fashion across your donor area to ensure the donor areas retain their natural appearance. The individual follicular units are stored until they are implanted into the recipient area resulting in natural-looking hair re-growth. What is the follicular unit extraction (FUE) method of hair restoration? Normal hair grows in groupings called follicular units. Typically, each follicular unit consists of one to four hairs follicles. Hair restoration or hair transplantation is a procedure during which the doctor removes individual follicular units from a donor site (located on the back and/or sides of the head) and transplants these units into the balding area of the head. 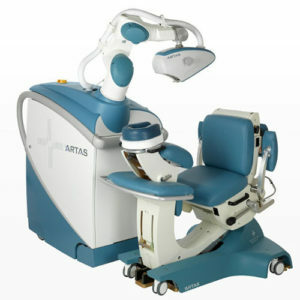 How will my hair look after the ARTAS®Robot Assisted FUE hair restoration procedure? 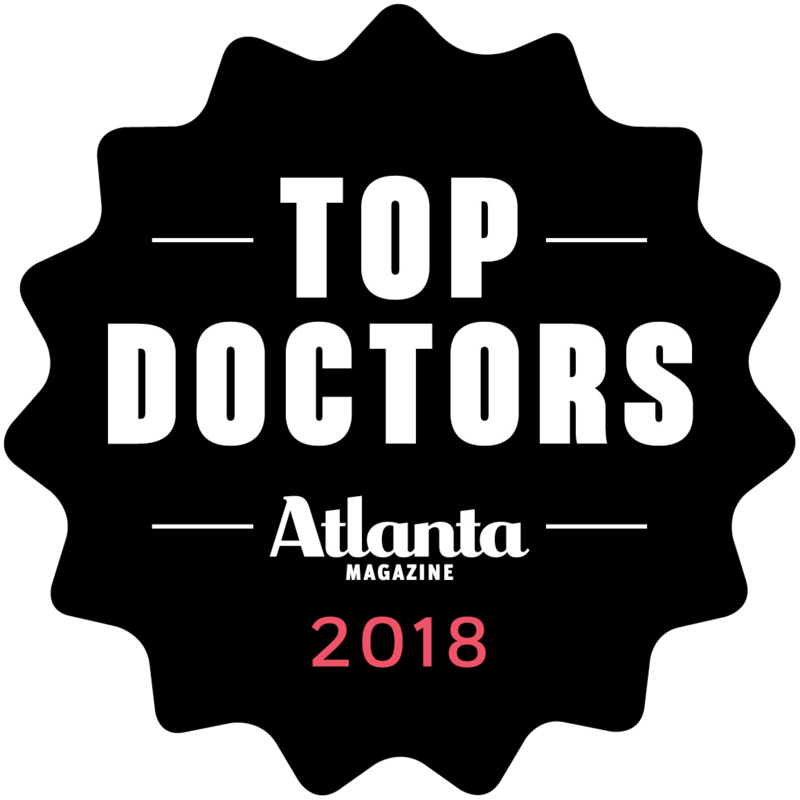 Dr. Anderson has developed his method of follicle placement for the past decade, and following the brief healing phase after the procedure, your hair will look and be natural. In the donor area on the back and sides of the scalp, patients typically experience very minimal scarring in these areas. After healing, the tiny round scars in the donor areas of the scalp are tiny and difficult to find through longer hair. Our patients are able to wear their hair any length or style with confidence. How are the Follicular Unit Extraction (FUE) hair restoration method results different than the old “Hair Plugs” people used to get? Old fashioned “hair plugs” included the harvesting of large patches of hair follicles that resulted in an awkward and unnatural appearance once implanted. The ARTAS®Robot Assisted FUE System uses its computer-assisted robotic arm and digital mapping to pinpoint individual follicular units from the donor area for dissection. This process provides Dr. Anderson more control and precision in designing a natural looking hair growth pattern following follicle harvesting from the donor area. Because the ARTAS® Robot Assisted FUE System enables unmatched precision and accuracy, Dr. Anderson is able to extract healthy robust grafts for optimal growth without altering the appearance of the donor area, or creating linear scars. Are hair transplant results permanent with the ARTAS® Robot Assisted FUE System? As with any method of hair restoration offered by the Anderson Center for Hair, an ARTAS® Robot Assisted FUE System procedure transplants permanent hair, typically from the back of the head, to thinning areas of the scalp. 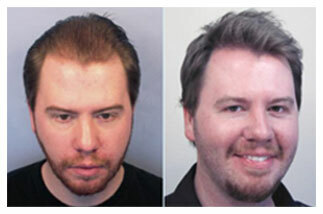 As this hair is not susceptible to conditions that cause male pattern baldness, transplanted hair can last a lifetime. See Hair Restoration for more details. How long does an ARTAS® Robot Assisted FUE System Procedure take? An ARTAS® Robot Assisted FUE System Procedure usually takes from four to eight hours as determined primarily by how many follicles are to be transplanted. Generally, the more hair loss one has, the more follicles will need to be transplanted to achieve your hair restoration goals. You are seated in a seated massage type chair during the process, with light sedation to ensure that you’re alert but relaxed. 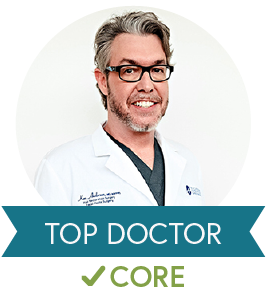 Dr. Anderson and his highly-trained staff are with you to ensure your comfort throughout the procedure. Of course, a catered lunch is served, so you won’t be hungry if your procedure time goes into the afternoon. Recovery time with the ARTAS® Robot Assisted FUE System Procedure is much less and much more comfortable as compared to a traditional linear strip method of hair restoration. As there is no linear incision required with an ARTAS® Procedure, healing time is short, and you can usually go back to your daily activities after a day or two. It takes approximately three days for the transplanted hair to “take” and for growth cells to be transferred from the follicles to the scalp. You will be using the medical-grade saline salt solution that we provide on your procedure day along with a spray bottle to keep the newly implanted hair moist with the saline solution. Don’t worry, all the post-procedure instructions are provided to you in writing and by email if you choose. Also, our Patient Care Coordinators are always available to answer questions about your post-procedure care. By about Day 5 or 6, the crusting will largely have subsided, leaving little evidence that any procedure has taken place at all. Transplanted hair grows naturally in long phases. The implanted hair takes time to develop its own blood supply, as with any hair transplant procedure. New hair is not usually seen until about three months after the transplant, and will continue to come in over the course of a full year. 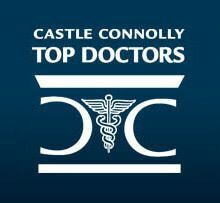 At approximately six months, you will enjoy a noticeable improvement and after a full year, you will see final results. Using either the traditional linear strip method, or the ARTAS® Robot Assisted FUE System method of hair restoration, after a short period of time following your procedure, it should not be evident that a procedure has taken place. The FUE method does have an advantage here, however: because the ARTAS® Robot Assisted FUE System harvests each follicular unit individually, there is no linear scar at the donor site as with the “strip” method. With the ARTAS® FUE Procedure, any scarring is minimal and is virtually undetectable. Transplanted hair grows in gradually, over a period of a year, reducing the chance that people will notice the procedure. Does the ARTAS® hair transplant procedure hurt? 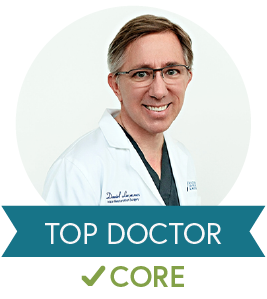 The ARTAS® FUE Procedure, an outpatient procedure performed in the doctor’s office, requires only a local anesthetic. Once the scalp is numb, you won’t feel any pain. 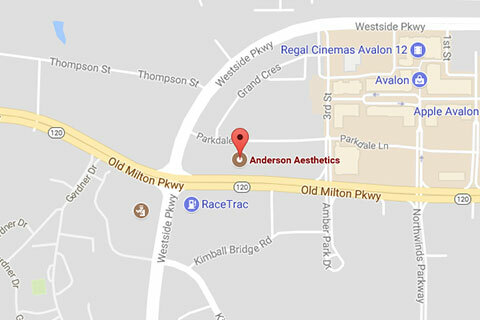 Dr. Anderson personally administers all of the local anesthesia, ensuring maximal patient comfort and safety. Some patients can experience minor discomfort and swelling post-procedure, which subsides in one to three days. Because the ARTAS® Robot Assisted FUE System Procedure harvests individual follicular units rather than removing a large area of scalp requiring sutures, there is minimal scarring in the donor area. Patients are able to wear their hair at any length or style with confidence. Trimming the patient’s hair in the donor area allows the ARTAS® System to accurately visualize, track and harvest each follicular unit for transplantation. If you are having a smaller procedure (typically patients with minimal to moderate hair loss), small areas in your donor area can be trimmed down for the procedure. After the procedure, the donor area hair grows back quickly and blends with the surrounding hair making the site almost undetectable within 7-10 days. After a month, you probably won’t be able to see a difference. What is the cost of the ARTAS® hair transplantation procedure? 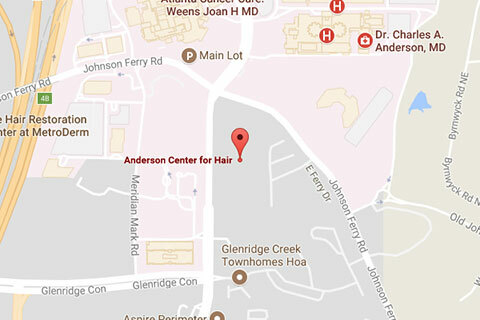 Treatment costs generally depend on how much hair loss you have, and how many follicles Dr. Anderson will be transplanting. With smaller amounts of hair loss, a smaller number of grafts are needed to correct the loss, and will result in lower costs as compared to a procedure in which a very large number of grafts are transplanted. We offer financing through CareCredit, with flexible and favorable terms for our patients, so please be sure to ask a Patient Care Coordinator about this option. Contact our office today to find out more about the ARTAS® robot assisted system and see the results of real patients.